But sources say the document doesn't contain anything that would derail her CIA confirmation chances. WASHINGTON — The Democratic staff of the Senate Intelligence Committee has prepared a classified background document on President Trump's CIA nominee that includes details some senators and aides have found disturbing, four people familiar with the document told NBC News. The document, which has been made available to senators and cleared aides, describes Gina Haspel's role in the CIA's post-9/11 torture program, citing cable traffic and internal CIA messages that were not discussed in her public confirmation hearing. The sources, some of whom support Haspel and some of whom do not, say the document describes comments by Haspel in support of the CIA's brutal interrogation program at the time it was ongoing. But they said there was nothing explosive that would change the dynamic of her confirmation chances, which appear to be strong. Three people familiar with the memo said it was drafted by committee staffer Evan Gottesman, who works closely with Sen. Ron Wyden of Oregon, a Haspel opponent. It was then vetted by CIA officers, who took factual issue with some portions. Some of the disputed passages were then removed at the behest of Mike Casey, the Democratic staff director, who works for Sen. Mark Warner of Virginia, the ranking Democrat on the committee. Warner is considering voting for Haspel. After NBC News began asking questions about the document, senators were informed Monday that it had been removed from the Senate's secure space, and that senators could request to see it from the intelligence committee by appointment, according to a document reviewed by NBC News. Hours later, senators and staff were again given access to the memo, officials said. Haspel was not an architect of the interrogation program, but she ran a secret CIA base in Thailand where a detainee was waterboarded and confined to a small box. Several years later, she played a role in the destruction of videotapes of interrogation sessions, drafting a cable ordering shredding that later was sent by her boss. The secret Senate document contains details of CIA interrogations that some found hard to read, the sources said. But they added it's not clear whether the senators and aides who reacted that way have also read the classified version of the 2014 Senate report on CIA interrogations, which contains photos and gruesome accounts of torture. Some may not even have read the 528-page public summary of that report, which itself is quite graphic, describing one interrogation session so brutal that some CIA personnel broke down in tears. The Senate Intelligence Committee is scheduled to vote on Haspel's nomination to head the CIA on Wednesday at 9:15 a.m. in a closed business meeting. Her nomination would then require a simple majority of the full Senate. Two Democrats — Joe Manchin of West Virginia and Joe Donnelly of Indiana — have expressed support for her; two Republicans — John McCain of Arizona and Rand Paul of Kentucky —are opposed. Even if every other Democrat voted against her, which is by no means assured, other Republicans would also have to oppose her to kill the nomination. Haspel has broad support among intelligence veterans from both parties, and at the moment, Senate aides and others involved in the nomination say she is expected to be confirmed. But some Republicans, including Jeff Flake of Arizona, have asked for more information. Flake said Friday he wants every senator to read the report of a special prosecutor who investigated Haspel's role in the tape destruction and other issues without filing charges. politicsWhy do so many spies want Gina Haspel to run the CIA? 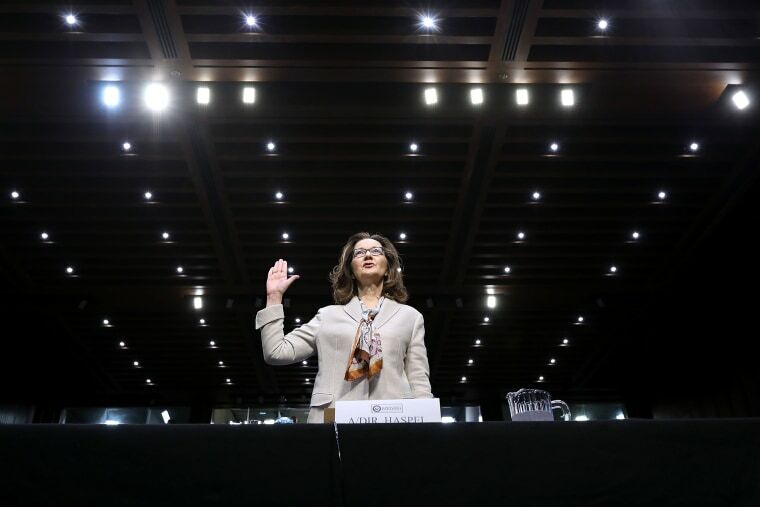 At her confirmation hearing last week, Haspel told senators that she believes torture was immoral and that the CIA would not resume interrogations of any sort on her watch. But she also said she believed the CIA obtained useful intelligence from its post-9/11 interrogation program, and she avoided questions about whether the harsh tactics were moral, consistent with American values, or sound policy. Sen. Angus King, a Maine independent who caucuses with Democrats, said he decided to oppose her because he found her answers "lawyerly" and "evasive." Sen. Ron Wyden of Oregon, who has seen classified documents about Haspel's role, asked her whether, between 2005 and 2007 when the program was winding down, she called for it to be continued or expanded. She did not answer directly, but said: "Like all of us who were in the counterterrorism center and working at CIA and those years after 9/11, we all believed in our work. We were committed, we had been charged with making sure the country wasn't attacked again, and we had been informed that the techniques in CIA's program were legal and authorized by the highest legal authority in our country and also the president." Two people who were present for her testimony in the closed committee session said she struck a slightly different tone behind closed doors, acknowledging that in retrospect, the harsh CIA interrogations eroded America's standing in the world. She told senators that she did not want to be seen as impugning her colleagues by saying something similar in public.